Softcover edition of Srila Prabhupada's original 1972 Macmillan Bhagavad-gita As It Is. It is a first-class EXACT reproduction of the original book. It contains all 48 original color plates and is truly wonderful... It is 5"x7.5" size. Format: Softcover, 5" x 7.5"
Original 1972 Complete edition. With translations and elaborate purports by His Divine Grace A.C. Bhaktivedanta Swami Prabhupada. No other philosophical or religious work reveals, in such a lucid and profound way, the nature of consciousness, the self, the universe and the Supreme. 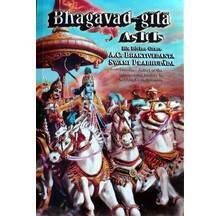 Bhagavad Gita As It Is is the largest-selling, most widely used edition of the Gita in the world. Soft-cover, 1000+ pages, 48 color plates. 5" x 7.5"
"No work in all Indian literature is more quoted, because none is better loved, in the West, than the Bhagavad Gita. Translation of such a work demands not only knowledge of Sanskrit, but an inward sympathy with the theme and a verbal artistry. For the poem is a symphony in which God is seen in all things....The Swami does a real service for students by investing the beloved Indian epic with fresh meaning. Whatever our outlook may be, we should all be grateful for the labor that has lead to this illuminating work." "The Gita can be seen as the main literary support for the great religious civilization of India, the oldest surviving culture in the world. The present translation and commentary is another manifestation of the permanent living importance of the Gita." 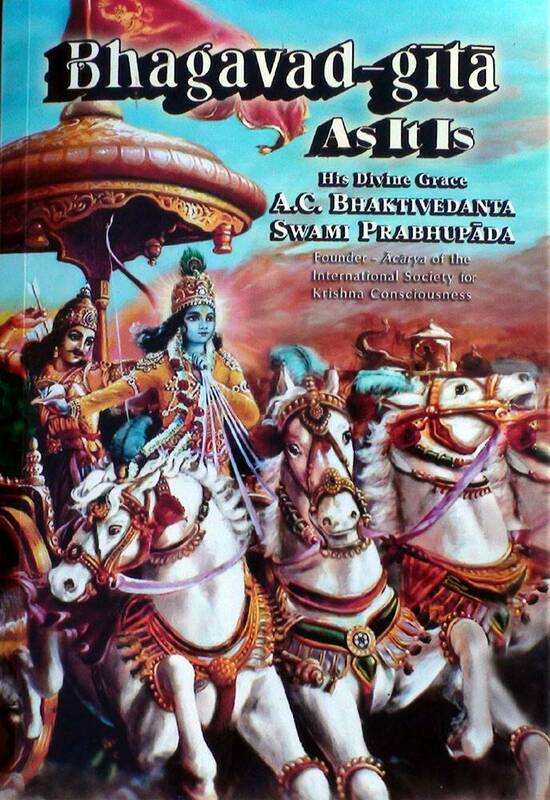 "I am most impressed with A.C. Bhaktivedanta Swami Prabhupada's scholarly and authoritative edition of Bhagavad Gita. It is a most valuable work for the scholar as well as the layman and is of great utility as a reference book as well as a textbook. I promptly recommend this edition to my students. It is a beautifully done book." "...As a successor in direct line from Caitanya, the author of Bhagavad Gita As It Is is entitled, according to Indian custom, to the majestic title of His Divine Grace A.C. Bhaktivedanta Swami Prabhupada. The great interest that his reading of the Bhagavad Gita holds for us is that it offers us an authorized interpretation according to the principles of the Caitanya tradition." "I have had the opportunity of examining several volumes published by the Bhaktivedanta Book Trust and have found them to be of excellent quality and of great value for use in college classes on Indian religions. This is particularly true of the BBT edition and translation of the Bhagavad Gita." "...If truth is what works, as Pierce and the pragmatists insist, there must be a kind of truth in the Bhagavad Gita As It Is, since those who follow its teachings display a joyous serenity usually missing in the bleak and strident lives of contemporary people." "There is little question that this edition is one of the best books available on the Gita and devotion. Prabhupada's translation is an ideal blend of literal accuracy and religious insight." "The Bhagavad Gita, one of the great spiritual texts, is not as yet a common part of our cultural milieu. This is probably less because it is alien per se than because we have lacked just the kind of close interpretative commentary upon it that Swami Bhaktivedanta has here provided, a commentary written from not only a scholar's but a practitioner's, a dedicated lifelong devotee's point of view." "The increasing numbers of Western readers interested in classical Vedic thought have been done a service by Swami Bhaktivedanta. By bringing us a new and living interpretation of a text already known to many, he has increased our understanding manyfold." Dr. Edward C Dimock, Jr.
"The scholarly world is again indebted to A. C. Bhaktivedanta Swami Prabhupada. Although Bhagavad Gita has been translated many times, Prabhupada adds a translation of singular importance with his commentary...."
"Srila Prabhupada's edition thus fills a sensitive gap in France, where many hope to become familiar with traditional Indian thought, beyond the commercial East-West hodgepodge that has arisen since the time Europeans first penetrated India. "Whether the reader be an adept of Indian spiritualism or not, a reading of the Bhagavad Gita As It Is will be extremely profitable. For many this will be the first contact with the true India, the ancient India, the eternal India." "As a native of India now living in the West, it has given me much grief to see so many of my fellow countrymen coming to the West in the role of gurus and spiritual leaders. For this reason, I am very excited to see the publication of Bhagavad Gita As It Is by Sri A.C. Bhaktivedanta Swami Prabhupada. It will help to stop the terrible cheating of false and unauthorized 'gurus' and 'yogis' and will give an opportunity to all people to understand the actual meaning of Oriental culture." "...It is a deeply felt, powerfully conceived and beautifully explained work. I don't know whether to praise more this translation of the Bhagavad Gita, its daring method of explanation, or the endless fertility of its ideas. I have never seen any other work on the Gita with such an important voice and style....It will occupy a significant place in the intellectual and ethical life of modern man for a long time to come." "I can say that in the Bhagavad Gita As It Is I have found explanations and answers to questions I had always posed regarding the interpretations of this sacred work, whose spiritual discipline I greatly admire. If the aesceticism and ideal of the apostles which form the message of the Bhagavad Gita As It Is were more widespread and more respected, the world in which we live would be transformed into a better, more fraternal place."